I am not one to cuss too often, but while reading this book I’ve strung about a million curse words in my head which means I really liked this book (go figure). There’s something in the way Marie Lu writes that hooks my attention. She doesn’t write overly romantic scenes and she’s fricking good at fight scenes—the perfect combination I’m looking for in YA books. 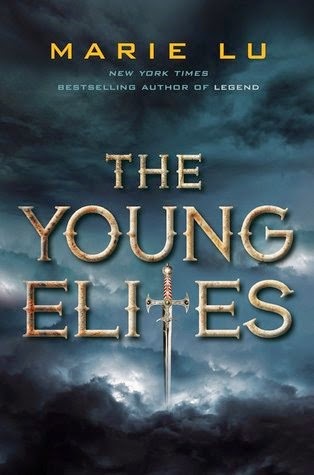 The Young Elites is a dark story with twisted characters. As what my friend would say, it’s very hard to find someone to cheer on. I do not know why I really liked this book because I am not normally into dark reads and twisted characters. I must say Marie Lu is a really good writer. There’s not much romance in here, but the few romantic scenes made my toes curl in my feet. Marie Lu might not be comfortable in writing romance scenes, but when she does, she does it very intensely. I like the world building. I’m never going to get tired of Renaissance-Italy-like setting, and this one is beautifully written. The details are good and I can see it clearly in my head as if I’m remembering it, not imagining it. The only thing I got confused about is the blood fever—where did it come from? That wasn’t quite clear in the book. Adelina Amouteru is my kind of heroine. Some might not think she’s not a villain, but I say she is. Or rather, she will be. The Young Elites feels like the making of a villain, because I got the impression that this is just showing her story, how she became a very twisted person. It shows what makes a person a villain. There are times when she sounds very flat, emotionless, and I can’t decide what I feel about it. Enzo Valenciano is a very driven character. You do not want to mess with him. He’s very harsh, but I love this guy. You don’t get a lot of emotions from him but I love him. I have no idea why. Perhaps it’s because of his driven nature, making him a great leader. Perhaps it’s because of the charms that he seems to have no idea he possesses. Perhaps it’s because of his loyalty to his friends (though he wouldn’t call them friends aloud). Perhaps it’s because he a no-nonsense kind of guy. Perhaps it’s because his intense personality. Perhaps it’s all of the above. So when Marie Lu decided to put him in a very dire predicament I almost threw my book across the room. I CANNOT accept it. Teren Santoro. Oh, boy. At first I thought he’s the most sane character in here, seeming to have clear intentions and goals: to punish all malfettos in the name of the king. But then we get his POV and boy, oh boy, he’s even more twisted than the most twisted in the history of twisted characters. So many times I want to shake this boy so hard it’ll rattle his teeth and ask What is wrong with you? Please tell me what’s wrong with him. Raffaele is my favorite character in this book. He’s a gentle soul, and he seems to be the most cheerful person—and nothing is cheerful in this book, so I think that’s saying something. So what did I get in this dark story with very twisted characters? I got to see a story of pain, betrayal, and the story behind what makes a villain. Intense, dark, extreme and creepy, I had no choice but to turn page after page until there’s no more and all that’s left is the anticipation for the next book.